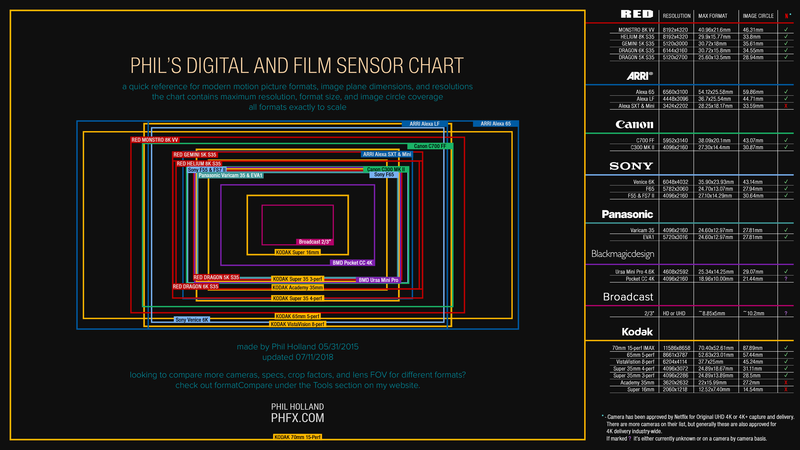 This newly updated, and highly useful chart, illustrates all major camera sensors side-by-side. Phil Holland has just updated his extremely popular sensor chart to include the latest cameras. This isn't just a list of sensor dimensions, but a full graphical illustration of them overlayed over each other so that it is possible to see at a glance how the sensors on the different models of camera compare directly. While Phil is a fantastic DP, it is great to see the effort he is going to to make such information so open and freely available. View the chart by clicking on the image below or the text link that follows it. Click here to view the full sensor chart, courtesy of Phil Holland.